German physician; born at Posen July 26, 1815; died at Kissingen Aug. 29, 1865. He studied medicine at the University of Berlin, graduated in 1838, and settled in the Prussian capital. From 1843 he was assistant at the pathological department of the university, and in 1847 received the "venia legendi" from his alma mater. 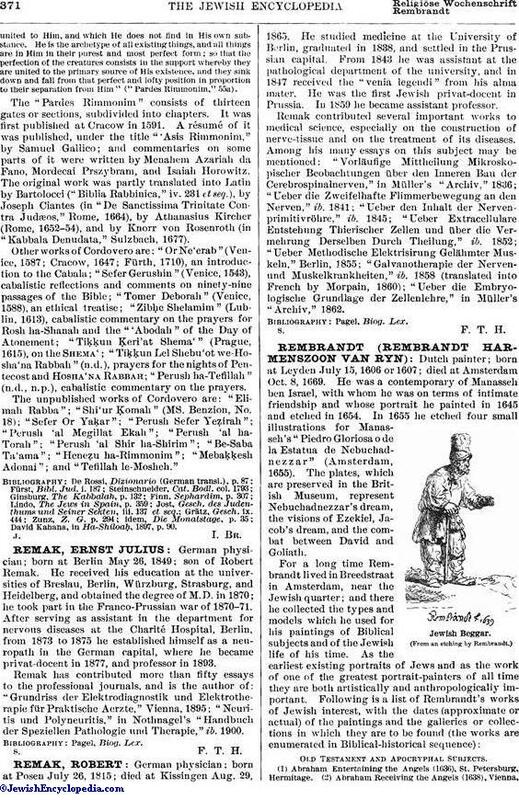 He was the first Jewish privat-docent in Prussia. In 1859 he became assistant professor. Remak contributed several important works to medical science, especially on the construction of nerve-tissue and on the treatment of its diseases. Among his many essays on this subject may be mentioned: "Vorläufige Mittheilung Mikroskopischer Beobachtungen über den Inneren Bau der Cerebrospinalnerven," in Müller's "Archiv," 1836; "Ueber die Zweifelhafte Flimmerbewegung an den Nerven," ib. 1841; "Ueber den Inhalt der Nervenprimitivröhre," ib. 1845; "Ueber Extracellulare Entstehung Thierischer Zellen und über die Vermehrung Derselben Durch Theilung," ib. 1852; "Ueber Methodische Elektrisirung Gelähmter Muskeln," Berlin, 1855; "Galvanotherapie der Nerven- und Muskelkrankheiten," ib. 1858 (translated into French by Morpain, 1860); "Ueber die Embryologische Grundlage der Zellenlehre," in Müller's "Archiv," 1862.